I am a patient and enthusiastic music educator and guitar/ukulele tutor with 16 years of playing experience, and 9 years of teaching experience. I pride myself on the friendly and supportive atmosphere created in my lessons, as well as my uniquely tailored approach to my students' musical education. 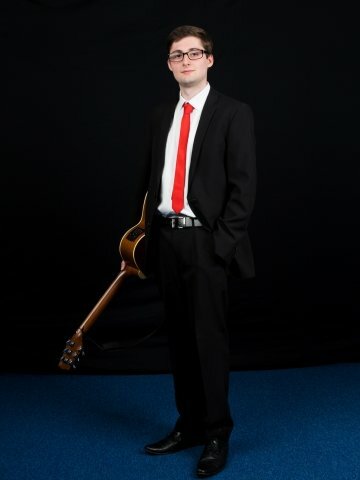 I have performed in a wide variety of genres: from rock and blues to classical guitar (gaining a Grade 8 Distinction aged 17), from jazz and musical theatre to modern experimental music. I bring this wealth of musical experience into my lessons. I am a regular performer, and personal highlights include regular performances at well-renowned music venue The Talking Heads during my Undergraduate Degree in Southampton, and performing at the 2015 Montreux Jazz Festival in Switzerland. I also perform regularly at my church, helping to lead worship and often directing the band/arranging music for the service. I studied and gained a Music BA (Hons) from the University of Southampton, providing me with a wide knowledge-base, and equipping me with the necessary skills for performing and teaching. I utilise these expertise in my lessons to give my students a well-rounded musical education. I am also a highly trained and experienced composer/arranger with a strong grasp of music theory gained through rigorous study at university. I am an experienced tutor through delivering nine years of private lessons to a wide variety of ages and abilities of students, most of whom developed a love of their subject which persists to this day. I studied and gained a PGDE from Nottingham Trent University after training to teach music, where I gained valuable experience of teaching more broadly, as well as teaching specifically music. I taught both GCSE and A-level students, as well as key stage 3. My current day-job is working for Warwickshire Music, teaching music and guitar/ukulele to primary and secondary aged students. I have an advanced DBS certificate, which is necessary for me to work in this role. My teaching experience is broad having taught all ages, which makes it easy for me to adapt my lessons to individual need and ability. I have experience in preparing students for Rockschool and Trinity guitar exams, and would encourage my students to consider studying for exams. However this will be the students' decision, and there is plenty to learn without studying for exams; I never force my students down a particular route, but view my role as facilitating the route the student chooses to take. I focus on a holistic approach to guitar and music tuition, as each of the areas I teach interlink. For instance, guitar/ukulele students will not only learn how to play their instrument, but will also learn elements of music theory, music technology, and songwriting as relevant to their needs. Students wanting to study composition or music theory will also gain some basic skills on piano and an understanding of how to write and arrange music. This would be particularly useful to those studying GCSE or A level music, the composition aspects of which I have taught over the past year. I also personalise my lessons: the first thing I ask my students is "What do you want to learn? Is there a particular song/tune/style of music you want to play?" This way I enthuse students from the first lesson with the music they are interested in, and once they have mastered the genre we discuss where we might want to move on to next. My tuition is a collaborative endeavour between me and my student, and I always support my students in whatever way they need. Reply from: Scott: Hi Nisha, thank you for your kind comments, I very much appreciate it. ScottFrom Sameer (5/5): Scott is an excellent teacher to my 6 year old. He is friendly, patient and easy-going which creates a very comfortable learning environment. His classes are engaging and taught at a nice pace which not only make it enjoyable for my son but also challenge him to learn more. This motivates my son to do better and the progression is evident. It's been over a month now and my son enjoys every lesson with Scott. In addition to Scott's brilliant teaching style, he is a thorough professional and communicating with him has been easy. I would recommend Scott to anyone looking for an excellent music teacher. Reply from: Scott: Thank you for your kind words Sameer, see you next lesson! ScottFrom Katja (5/5): Very professional, encouraging and nice! Reply from: Scott: Thank Katja! ScottFrom Sebastien (5/5): Great tutoring and lessons, would recommend. ScottFrom Aksinya (5/5): Scott is a very patient and excellent teacher. We are really impressed by the progress that our son has already made. He started playing "jingle bells" one fine day and we were really surprised because we thought he had just started his guitar lessons !!! Scott will work with your timings as well so it is easy to reschedule lessons if need arises. Above all Aezel considers Scott as a friend and really look forwards to his lessons. Reply from: Scott: Thanks Aksinya, thank you for your feedback. It's a credit to your son how fast he's improving! Onwards and upwards, looking forward to the next lesson! ScottFrom Daniel (5/5): Lessons with Scott are very structured and informative whilst also being very enjoyable. His support has enabled me to learn songs which I would have considered too complex prior to his tuition. Reply from: Scott: Thanks Dan, you're doing so well! ScottFrom Tom (5/5): I'm really enjoing my weekly bass lessons with Scott, and find his teaching style to be professional and personable. He tailors the lessons to suit my music tastes, and introduces tricky musical concepts in an approachable way. Thanks to Scott, I've gone from a complete novice to someone gaining more and more confidence with the bass guitar every week. Perhaps most importantly, his lessons are always fun! I would highly recommend Scott to anyone looking to learn bass guitar. Reply from: Scott: Thanks Tom, really appreciate the feedback! ScottFrom Roxanne (5/5): Scott has been excellent with our daughter who was a total beginner with ukulele. My daughter enjoys her weekly lessons. He is patient, encouraging and flexible. Would recommend for any young children looking to play a musical instrument. Reply from: Scott: Thank you Roxanne, I really appreciate the positive feedback! She's doing so well, really pleased with how musical she is becoming! ScottFrom Karthik (5/5): Very good teacher - patient, professional, and lessons catered to individual ability/goals. Highly recommend! Reply from: Scott: Thank you Karthik, that means a lot. You're progressing really well, keep up the hard work! ScottFrom Gayle (5/5): Great tutor and I'm really enjoying the lessons. Will be booking another group of lessons when I have finished the 6 that I originally signed up for. Reply from: Scott: Thank you, glad to hear you're enjoying the lessons! You're making great progress. ScottFrom Jodie (5/5): From the first email I sent to Scott, he has been brilliant. My daughter and her friend who have a joint lesson really enjoy their tutoring and I love hearing what they have learnt. Scott is extremely friendly and made me and the girls feel very relaxed and the girls look forward to their ukulele lesson every week. Couldn't recommend enough. Reply from: Scott: Thanks Jodie, glad the girls are enjoying it! They're making excellent progress. ScottFrom Keven (4/5): Very good, just did not quite fit the profile of the job in question. Reply from: Scott: Thanks Kealie!